I think I have a problem. I really love making crafts and quilts and things. I love finding all the inspiration on pinterest and I get all excited and want to try it all. Problem is, I have like 5 or 6 projects going on that are half completed. I think I have crafters ADD. Like, I was doing the cat quilt the other day, and after an hour or so my brain was like, hey, black and white is borrring….lets do something new. 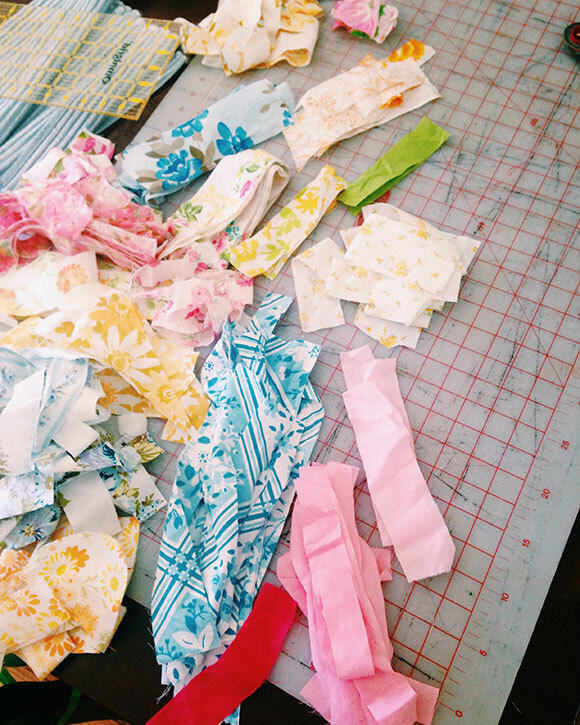 So, I put it aside and started cutting more fabric scraps for the string quilt. Brain: So, I’m getting sick of cutting scraps, lets sew something. Brain: hey, HEY, this is taking forever to do, lets go watch tv. And then the project gets set aside for another time. Is it just me, or do any of you have this problem as well? I have almost finished a quilt top, but it was a pretty basic one with huge 18 inch blocks. Good for my brain. 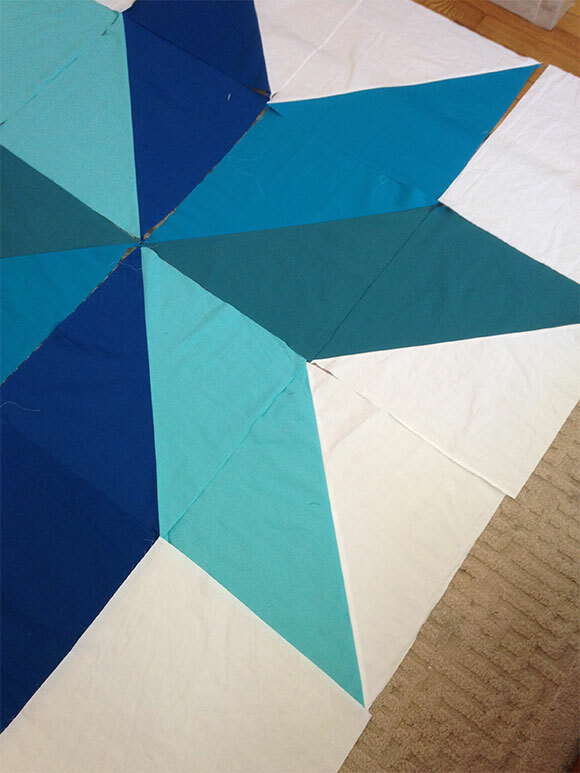 So, heres a look at the progress of some of my quilts: The big blue star quilt top is almost put together since I took this. I turn on Dr Who and I get things done. David Tennant is my favorite Doctor so far in case you’re all wondering. Just finished the Ood episodes. Very good. 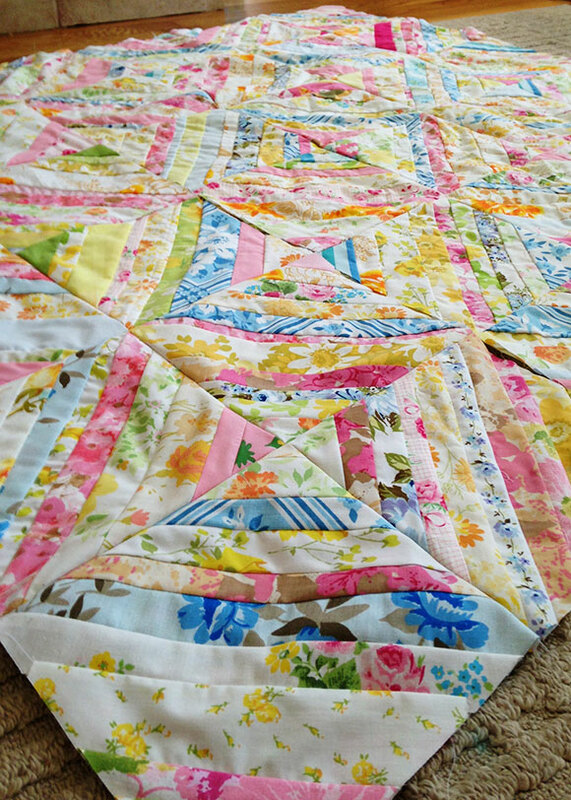 The vintage floral string quilt. Its getting there. I plug away occasionally and when I do sew blocks for it, I like to do 12 at a time so I can add it do the main piece. If I get my star top done, I’ll get on this one, or maybe fiddle with the cat quilt (no progress on the cat quilt since last blogged about it). Lately its been feeling very GO GO GO. We’ve had birthdays to celebrate, jujitsu tournaments to go to, military forms to fill out and the list goes on. Theres a family BBQ and then camping and then a birthday party all in one month. So much busy, so much stress. The heat has not helped. I turn into a slug when the weather is too warm. I like to lay in front of the fan and just lay there, tv is optional. So, that being said, this week I got a much needed rest. My dad had a few days off during the week and asked if they could visit. Well, HECK YES! They were packed and ready to go the moment they heard they were visiting Nana and Papa. Now, Tony still is working while they are away, so I pretty much am alone for these couple days. Its been so nice. No plans to make, no expectations, no rushing around. Yesterday I cooked myself a poached egg – I hardly put effort into food these days, theres no time. It was delightful to sit and savour coffee instead of gulping it while helping children clean spilled cereal and milk. I played computer games, I walked half an hour to the thrift store without any whining or fighting. I browsed said thrift store without feeling rushed. It was fantastic. I put effort into dinner and made fresh spring rolls that the children would hate. So relaxing and enjoyable. Today I am going to have lunch with Tony in Vancouver and then work on some quilt stuff. I’ve got a lot of fabric to wash and cut. I should fit in some house work like mop my filthy floors. Barefooted children drag in so much dirt. It doesn’t help that they play in sand and dirt and everything outside all day long. Speaking of children, they are having a blast at Nana and Papas house. I called to find out how they were doing, I do miss them still. My dad took them blueberry picking yesterday morning. They picked me some blueberries and ate a ton. Papa took Lucas to store (Lucas is my dads shadow these days) and Sadie had a tea party and had her nails painted. They captured spiders to show my horrified sisters. It was good day. 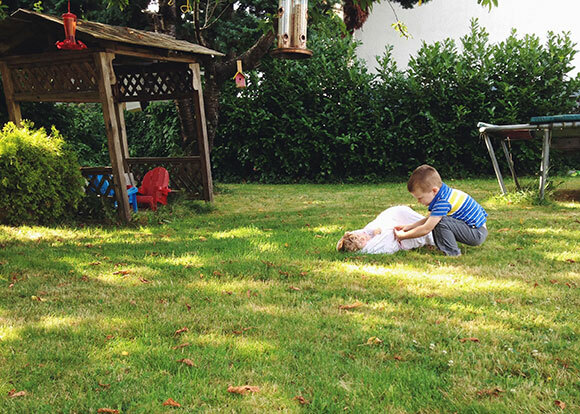 Today they’ll take it easier and just hang out in my dad’s garden and do gardening things. If you wanna do the same, leave a link in the comments, I’d love to see your weekly moments. Joining Soulemama with these posts. 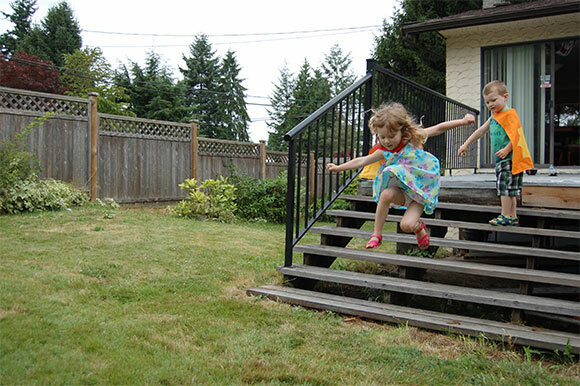 I turned to look and I see both kids jumping off the couch (or bed) and pretending to fly. Both my children love to pretend, and I love it. 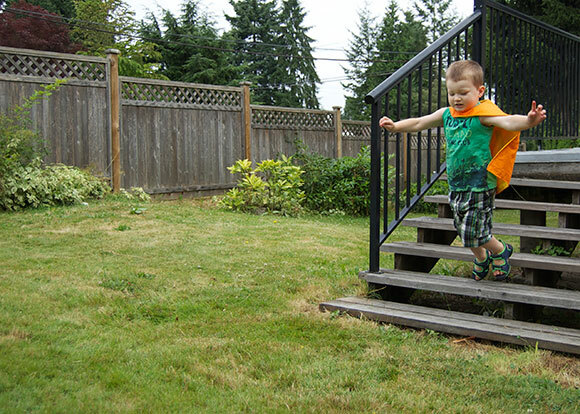 They pretend they’re cats, superheroes, babies, and birds. So, my first thought is that they should really have some dress up clothes to help with their little imaginations. 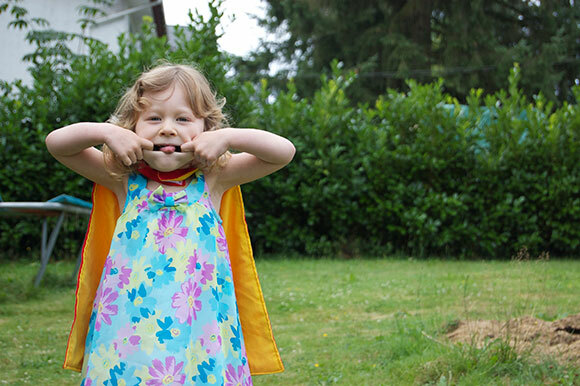 They already have dinosaur tails, so why not capes? 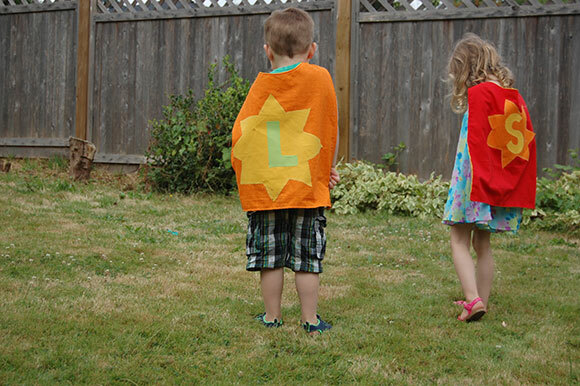 Making capes was super easy, and I even appliquéd for the first time. Yup, I put that fusible web (thats been collecting dust in my sewing bin) to work. I loosely followed this tutorial, kinda winging it, and they turned out. Each kid really loves the that the letter of their first name is on the cape. So, any ideas on what I should make next for them? I’m thinking felt crowns, but I also saw a cute fox scarf/hoodie that I might attempt this fall. If you wanna do the same, leave a link in the comments, I’d love to see your weekly moments. Getting ready to get some more blocks done on the string quilt. Its so blasted hot out. This next week is supposed to be stupid hot as well. I allowed homemade popsicles for breakfast because its that hot out. Yup. Breakfastsicles! 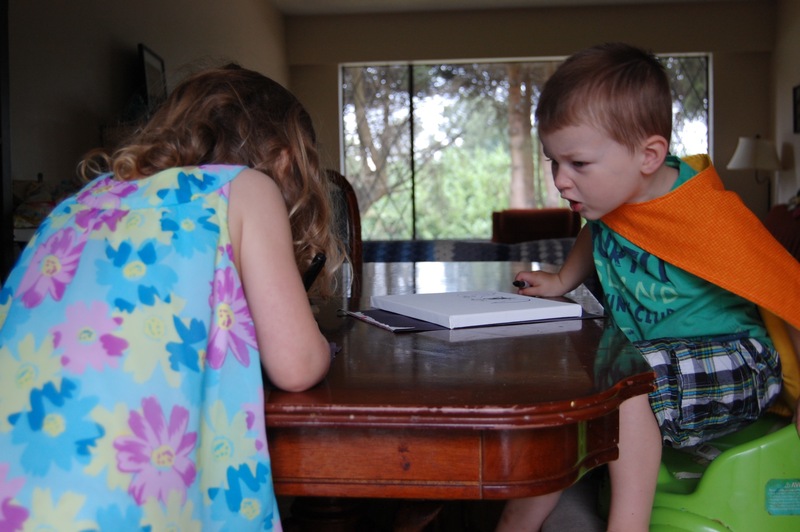 We’ve been playing outside in the morning, and then retreating inside for the afternoon to sweat it out in my room. My room has the big bed and box fan that blows right over it, so its the best spot during the hottest part of the day. 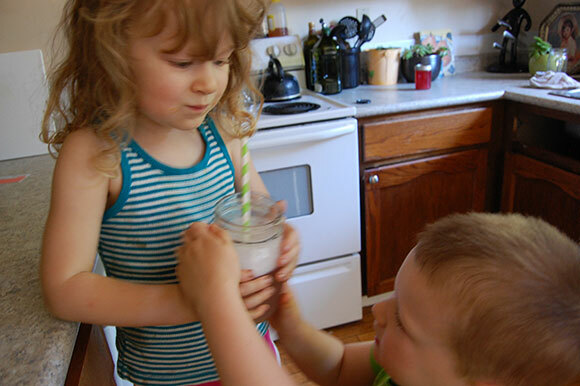 Before it got really hot inside, I decided to make a fun fizzy treat for the afternoon. I used my simple syrup ratio :1 cup sugar, 1 cup water, and then added about 2 cups of rhubarb, and once it got boiling, simmered it for 20 minutes on low. Then, I strained it and refrigerated it for a bit. 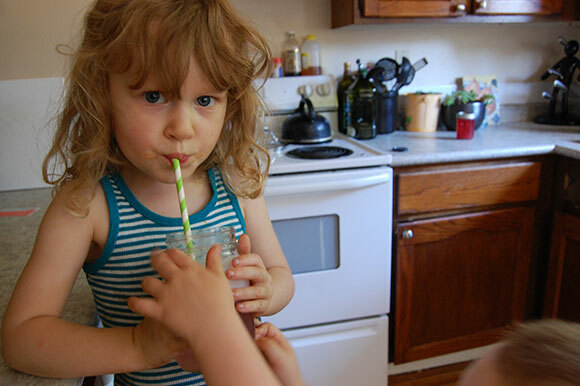 We added our syrup to club soda until it tasted good. I added a squeeze of lime cause that’s how I roll. It was a huge hit with everyone in the family. I’m going to try this next with raspberries, maybe add less sugar because I like it tart. This was a good hot day treat.